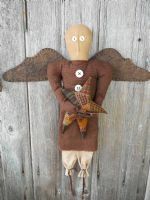 This Primitive Angel measures 18” and is made to hang up. 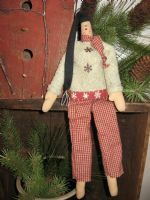 She is holding a quilted star that is made from scraps of homespun. 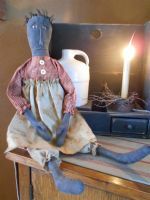 I made her using stained muslin and gave her a pinch stitched nose and mother of pearl button eyes. Her dress is Cranberry ,Mini checked Brushed flannel homespun with two vintage buttons sewn down the front. Her arms & legs are made from sticks. 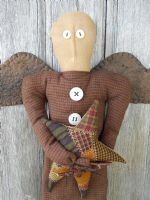 This angels wings are made of stiffened wool felt that I have sewn a blanket stitch around. 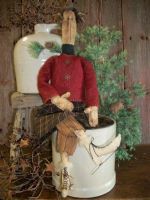 Excellent doll to keep up all year round!! 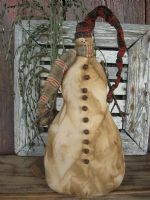 This is a doll based on a pattern by Sunny Knoll Folk Art & Crafts. $36.50. FREE SHIPPING IN 48 U.S. Others E-Mail me. I offer $$ off average U.S. shipping costs.